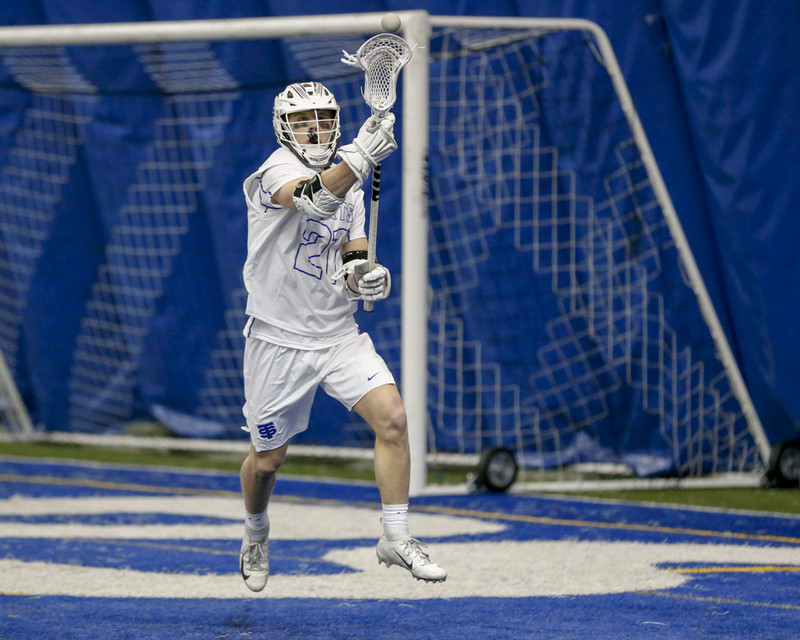 McClain Beaudette was not planning to play lacrosse for St. Thomas Academy this spring. Having not played the sport since eighth grade, Beaudette was considering another spring sport after his hockey season with the Cadets came to a close. However, the lacrosse team had a problem. With last year's goalie William Herzog out with a torn ACL suffered during last fall's football season, they needed a player. And once they found out Beaudette had experience, they began lobbying. "I was actually going to run track this year," Beaudette said. "But two weeks before the season started, they said, 'We don't really have a goalie.'" Fast forward a few weeks, Beaudette's 11 saves clinched a near-shutout as St. Thomas Academy (1-0) started its season with a 12-1 victory over Holy Angels (0-1) on Friday at the Academy of Holy Angels StarDome. After the game, Cadets coach Luke Marks explained that the loss of last year's all-conference goalie looked like a big problem for the Cadets before the start of the season. Friday's game helped calm some of his nerves. "We knew we were going to miss Will in the net, just from a team standpoint," Marks said. "And McClain doesn't skip a beat. So we're very fortunate to have that." The reborn goaltender was quick to credit his backline teammates, too, in his first game back in the sport. "The defense was excellent tonight, too," Beaudette said. "They were excellent. It was a blast." While Beaudette and his defense helped keep the Stars out of the net, St. Thomas Academy's offense started to click. Luke Williams, a senior attackman, scored five goals in the victory while senior midfielder Lleyton Hornig scored twice. Max O'Connell scored the lone goal for Holy Angels. While the Cadets offense controlled play for a majority of the game, the team's focus was on the near-shutout. "I've got to give the props to the defense," Williams said. 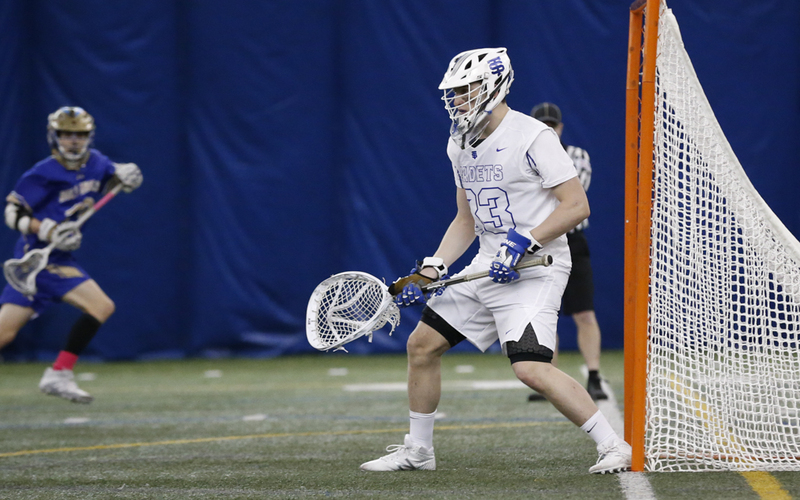 "Giving up one goal is very tough in any sport, especially lacrosse when it is a high-scoring game — fast paced —and it was our goalie's first game." With the win, St. Thomas Academy ensured its spring season started on better footing than last year. In its first game last April, St. Thomas Academy found itself on the losing end of a 14-11 game at Holy Angels. The Cadets also lost the following game to Mahtomedi, 10-6, before winning the next 11 consecutive games to close out the regular season. This year, the Cadets already have win No. 1. "It's our second year, but a lot of these kids have been in our program for four or five years," Marks said. "It's good to have some of these guys come away with a win." St. Thomas Academy started its 2018 campaign with consecutive losses, which wound up being its only defeats in the regular season. This year, the Cadets didn’t have to wait as long to record their first win. 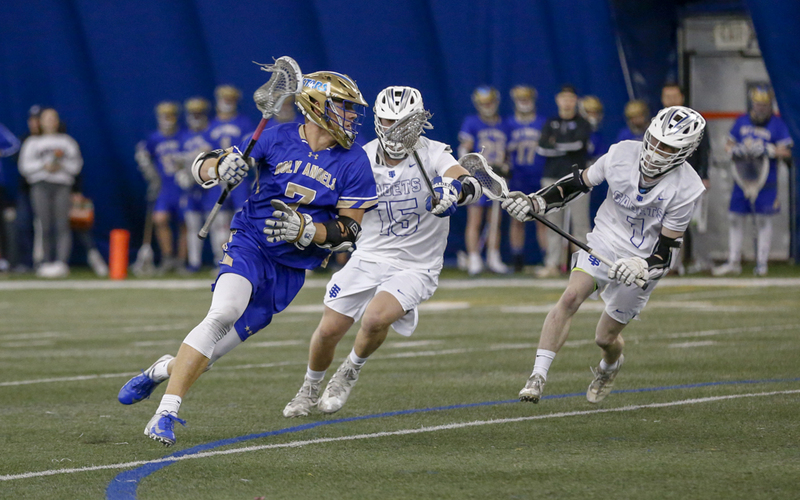 St. Thomas Academy (1-0) limited Holy Angels to just one goal while senior attackman Luke Williams scored five goals and recorded an assist in the Cadets’ 12-1 season-opening victory on Friday night at the Academy of Holy Angels StarDome. McClain Beaudette, playing his first game in goal for St. Thomas Academy, made 11 saves in the victory. Lleyton Hornig scored twice. Max O'Connell scored the lone goal for Holy Angels (0-1). The Panthers trailed 6-4 at halftime, but were led by Tyler Winship and Collin Schulz, who combined for seven second-half goals, to defeat their South Suburban Conference rivals.